The Lloyd Center has received $10,000 from BayCoast Bank in support of the Center’s Science Programs in the Fall River Public Schools. 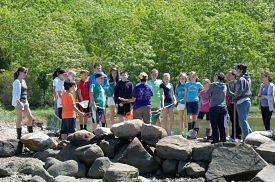 Aligned with the Massachusetts curriculum frameworks in science and engineering, the Lloyd Center’s science programs focus on local biodiversity, introducing age-appropriate math, writing and critical thinking. Students will be immersed in experiential learning in their science classrooms and in field projects. A key objective of this work is to involve students in activities that inspire a passion for science, while facilitating discovery of the significant relationship between human communities and natural systems. Thanks to the support of BayCoast Bank, the Lloyd Center is able to continue bringing science into the Fall River public schools.